This post is sponsored by Sunwarrior. I only recommend products that I personally use. All opinions are my own. Chocolate Nice Cream – ice cream healthy enough for breakfast? That’s right! This dairy free treat is packed with protein and healthy ingredients, zero sugar, and made in your food processor! Ice cream that’s healthy enough for breakfast? You got it! Sometimes, toast or cereal just won’t do. Sometimes, I crave something a little more fun. 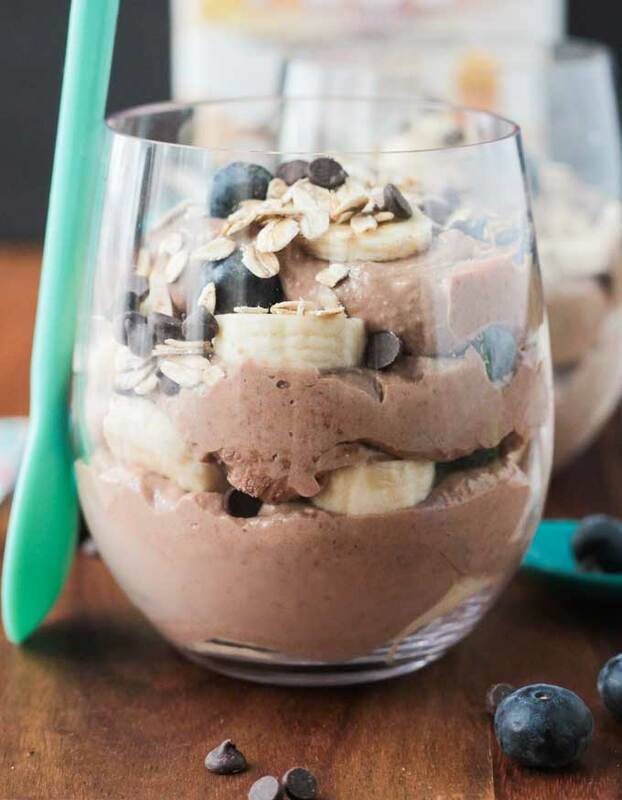 This Chocolate Nice Cream Breakfast Parfait is loaded with nutritious ingredients, packed with protein and fiber, cool and creamy, and just what you need to start your day off on the right foot. And you definitely don’t need an ice cream maker for this healthy treat! It’s all made with the ease of your food processor. Ready to dig in? What is Chocolate Nice Cream? If you haven’t heard of nice cream, it’s time to learn. You will not be disappointed! This vegan ice cream is made from frozen bananas. That’s it, just bananas. You can add all sorts of flavors, but the base is just frozen bananas whirred around in your food processor until smooth. The texture is like soft serve and it’s divine! In this chocolate version, I’ve added cocoa powder, peanut butter and protein powder for some added oomph. I have been working out a lot lately. In fact, I’ve even hired a personal trainer and have been working with him twice a week as well as hitting up some group classes on other days. I’ve always been active, but I’ve lifted more weights in the last 4 weeks than I probably have in the last 10 years. Protein is important for muscle recovery. I work out in the mornings and don’t like to eat a lot beforehand. So, I’ve been eating something light and then coming home afterwards and indulging in this little treat. Sure, you could add some protein powder to a smoothie – and while that’s delicious too – this chocolate nice cream feels like a much deserved reward for working so hard. Sunwarrior is a health-conscious company making protein powders and supplements with the best all natural plant based foods. Their products are always free of GMO’s, gluten, soy, yeast, added sugar, artifical colors, flavors and preservatives. 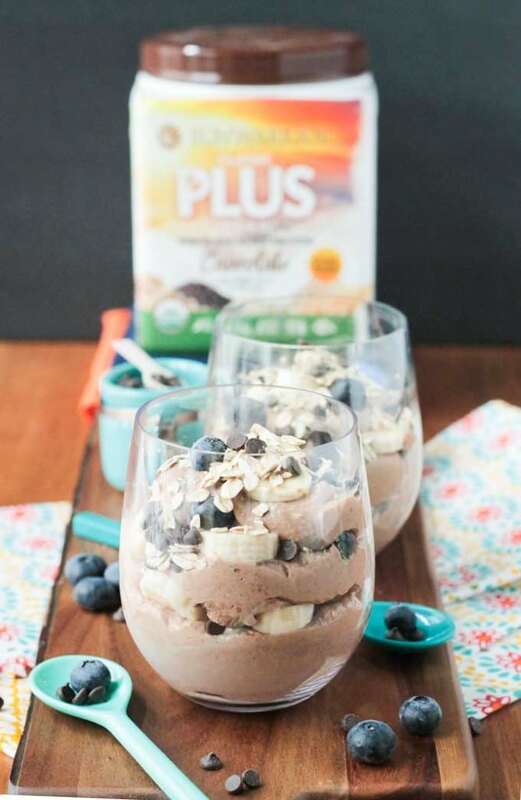 In this Chocolate Nice Cream Breakfast Parfait recipe I used Sunwarriors’s Classic Plus in Chocolate. In addition to all the goodness mentioned above, this particular blend is also certified organic, raw, sprouted and fermented. It’s made from quinoa, brown rice, peas, amaranth and chia. How’s that for an impressive nutrient profile? 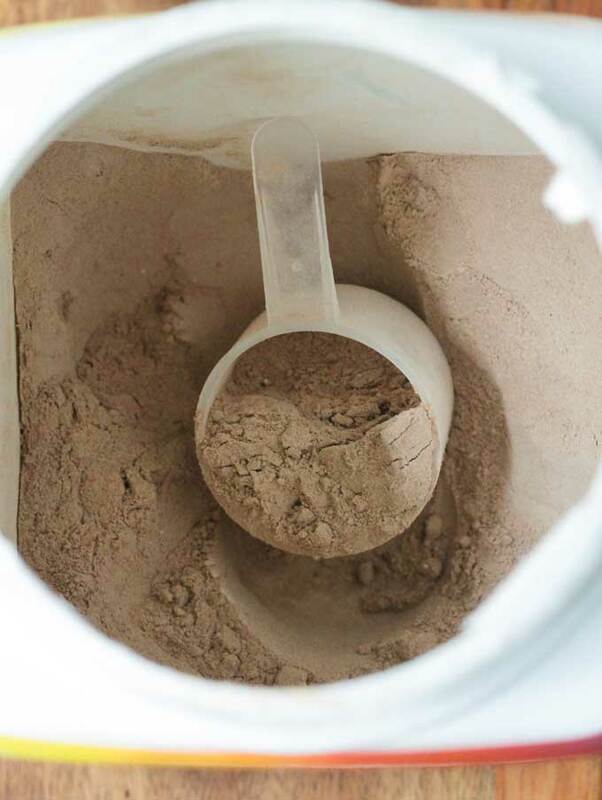 This protein powder is super fine and blends easily and completely. No gritty texture. Besides the chocolate flavor, you can find it in vanilla and natural, as well. 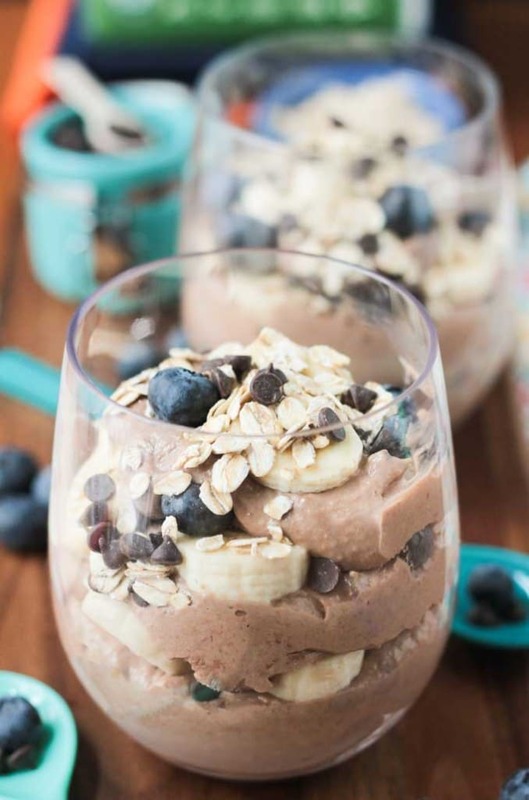 Not only does this Chocolate Nice Cream Breakfast Parfait make the perfect breakfast or post-workout meal, but it also makes an incredibly delicious dessert that no one would guess is healthy. You can skip the protein powder if you are making it for dessert, or any other time you don’t necessarily need the added protein. Now, having said that, you certainly don’t need to be a working out all the time to enjoy a little protein powder now and then. We don’t all eat perfect diets all the time, so there are many times you might need a protein boost. You know your body best, so listen to it, and always consult a health care professional if you have any concerns. Of course, my kids won’t let me eat this in peace…they want some too! So, I’ve been doubling the recipe below without the protein powder, scooping some out for them and then adding the protein powder in and processing again for me. So, what do you think? Are you ready to try some Chocolate Nice Cream for breakfast? You can eat it all by itself if you choose, but since I’ve been using it as my main breakfast, I loaded it up parfait style with fresh banana slices, blueberries, rolled oats and some mini chocolate chips just because. If you give this recipe a try, please leave me a comment below with your feedback. I’d love to see your amazing pictures too – find me on Instagram and/ or Twitter and be sure to tag @veggie_inspired and #veggieinspired so I don’t miss it. 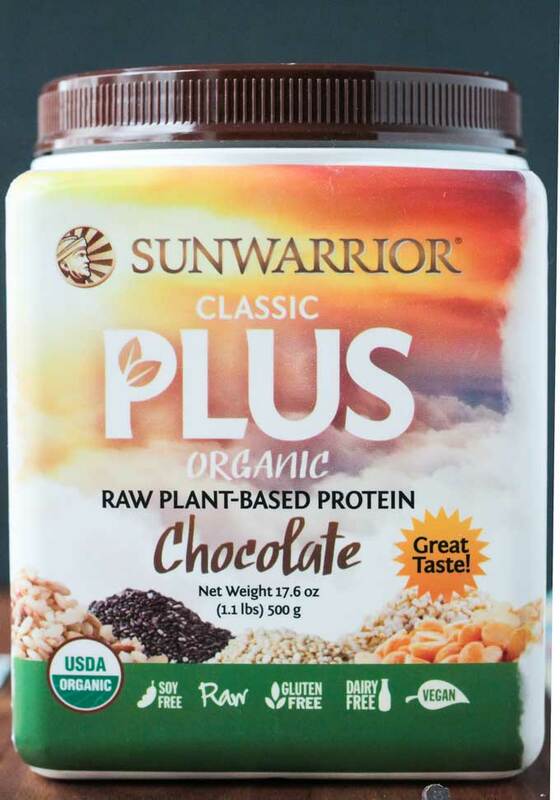 Sunwarrior is also on Instagram, so if you add the protein powder to the Chocolate Nice Cream, tag @sunwarriortribe as well! Chocolate ice cream that's healthy enough for breakfast! 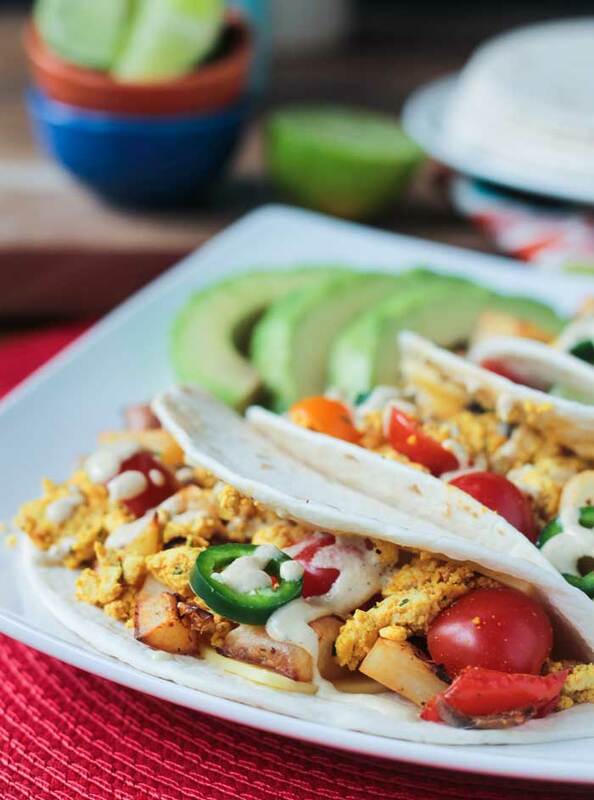 It's loaded with nutritious ingredients, packed with protein and fiber and cool and creamy! Eat it for dessert too! No one will know it's good for you! Place frozen bananas, peanut butter, protein powder, cocoa powder, vanilla and non-dairy milk in a food processor and process until smooth, scraping down the sides as necessary. 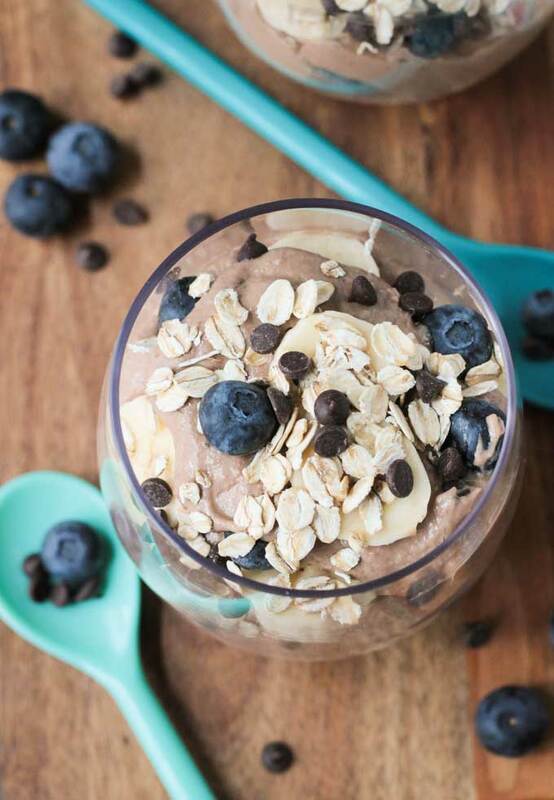 Layer the chocolate nice cream with fresh banana slices, raw rolled oats, chocolate chips and blueberries (or whatever else your heart desires). *You can keep the chocolate nice cream in the freezer, but it does get pretty hard. You will probably need to thaw it out a bit and stir before eating. ~Nutrition facts calculated for the Chocolate N'Ice Cream alone, not with any additional toppings. Wow, this chocolate nice cream recipe is the best version of “nice” cream that I’ve tried so far, very rich and creamy in texture, great chocolate flavor. I’m doubling this recipe the next time, SO good!! Thank you, Sharon! So happy to hear you loved it. Ice Cream for breakfast is never a bad thing, right?! I am down with any recipe that allows me to eat ice cream for breakfast! Love this recipe! Do you know the dietary facts by chance? Hi, Hilary. Thank you! I do not, but there are a number of free online sites where you can plug it in. My Fitness Pal is one that comes to mind off the top of my head. Oh my gosh, I had this for breakfast this morning and it was absolutely delicious. Chocolate for breakfast? Totally count me in! 🙂 This looks so yummy, Jenn! Thanks, Sina! Nothing better than dessert for breakfast! Can’t believe I’ve still not made nice cream. I’ve heard so many good things about it. I just never remember to put the bananas in the freezer! Really like the sound of this protein powder too, sprouting and fermenting really helps digestion. Oh, Choclette, you have to try it! You would love it! I purposely buy more bananas in a week than I know we will eat. Then when they get brown, I peel them, cut them up, and stick them in the freezer. I always have a huge bagful! And, yes, this protein powder is a good one for sure! What a brilliant idea! I need to make nice cream again, I tried once years ago but it didn’t look anywhere near this good!! Thanks, Becca! I love nice cream. It’s so easy and truly does taste like soft serve! Welp, you’ve won me over! I love it when you find breakfasts that disguise themselves as desserts! Any excuse for a sweet treat for breakfast is ok by me!! Thanks, Sarah! Wow, what a way to start the day!! 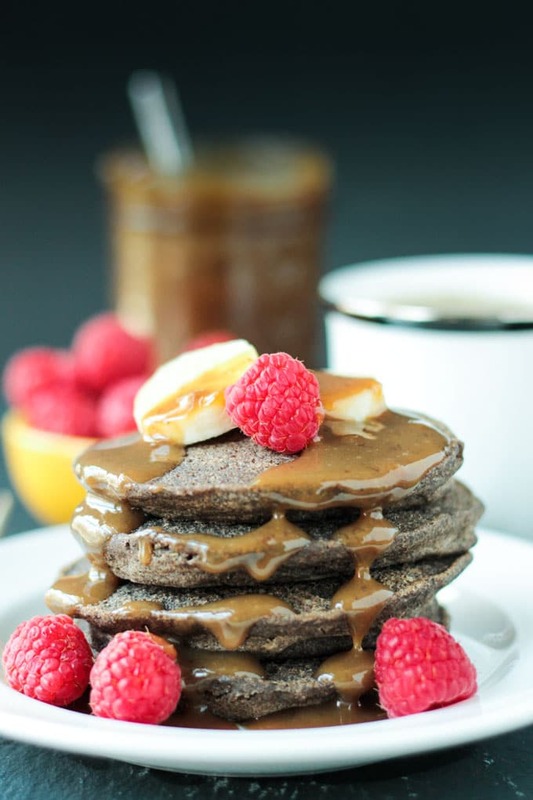 This looks absolutely gorgeous, perfect for a weekend breakfast treat. Yum! 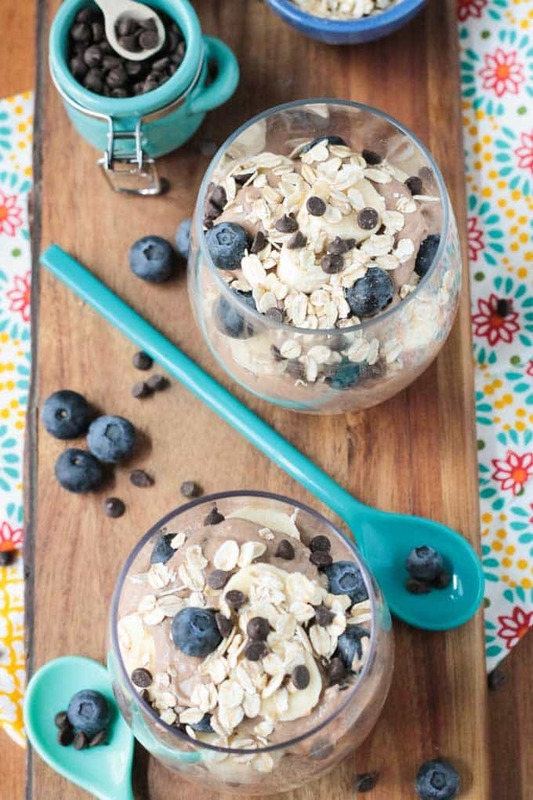 I could never say no to nice cream for breakfast and these parfaits look delicious. Right? I like to blame all the sweets I make on my kids too, but really they are for me. 🙂 Thanks, Donna! I don’t think this would even make it to the freezer! We do love ourselves some nice cream but I’m glad to get the “ok” to have it for breakfast. This nice cream looks wonderful, Jenn! I love that it’s for breakfast too. Oh and I absolutely adore those turquoise spoons! Any chance you remember where you got them? Thanks, Vanessa! The spoons are from Target. They had shorter ones too…and a whole bunch of ice cream bowls and sundae “glasses”. Lots of cute stuff. I found them in the seasonal aisle of all the dishes. WooHoo!! I’m so glad you liked it, Hedi! I’ve added it to oatmeal too. Yum! Umm, ice cream from breakfast?! Can I?! Yes please!! YUMMMMM. You can! You can! Thanks, girl! I love making a recipe just like this for breakfast – so nourishing and satisfying! Wow1 that looks like I can pass it off for breakfast too 🙂 Its like dessert for breakfast. Yes, absolutely healthy enough for breakfast, Manju! Thanks! 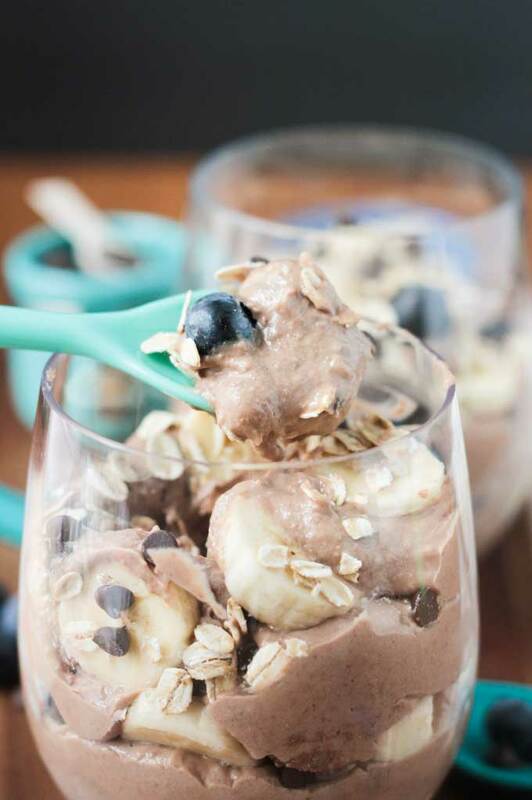 This looks like such a wonderful chocolatey take on nice cream, love the nut butter in it! That would help camoflauge the banana flavor, lol! 😉 And awesome about the weights! I’ve been lifting weights for as long as I can remember…love, love the results they give way more than cardio! Thanks, Brandi! You could add even more nut butter (and probably a little extra milk) to further disguise the banana. More vanilla would help too! 🙂 Weights rule! I’ve known it forever, but have been intimidated by all of them. Hoping after a few months with the trainer, I’ll be able to do it on my own! Loved your ingredients Jenn! That too for breakfast I will get in to this:) pictures awesome! Thank you so much, Uma! Enjoy! One look at those gorgeous pictures and my stomach started to growl. Sadly I don’t have any frozen bananas so I had to settle for one at room temperature. I’m going to buy ripe bananas today so I can make this tomorrow. YUM! i have tried their product before and really enjoyed it.ice cream for breakfast, count me in! Oh great, Dixya!! It blends so perfectly! You would never know it was in there. Thanks! I haven’t heard of nice cream, but I’m all in. Kudos on the working out. 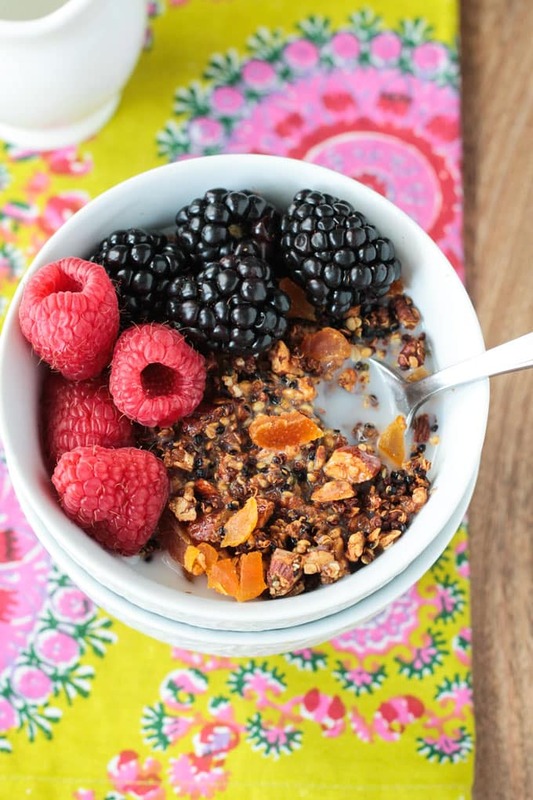 You definitely deserve to eat this for breakfast, lunch and dinner! Kelly, you should definitely try it! It truly does taste like soft serve ice cream – so so good!! Thanks! That’s awesome that you’ve been lifting weights so rigorously! It’s been way too long since I’ve made nice cream. Yours sounds fabulous, especially parfait-style! I really wish I could eat nice cream :'( I’m allergic to raw bananas and it breaks my heart every time I see a delicious raw banana dessert like this! Anyway, it sounds amazing! LOL! Yes, I totally know what you mean. This one stayed creamy even after freezing (and thawing a little bit) which I haven’t had luck doing with just plain nice cream. It’s a win! Ice cream for breakfast sounds like my kind of breakfast! Chocolate and ice cream for breakfast <3 100% good to me! Right? What could be wrong about ice cream for breakfast? 🙂 Thanks, Rebecca!